Papastratos Cigarettes Advertisement poster, 1961. 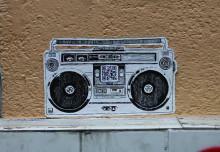 Architecture in Athens, sees a short yet important boom during the 60’s. The architectural community, is introduced to and influenced by modern movement, the international strive to establish the disciplne as a driving force to improving society as well as a desire to foreground its intellectual dimension, thus engaging it with broader cultural issues. Supported by a boosted economy, a nenewed academia emancipated with a group of academics such as Ioannis Despotopoulos, Thoukididis Valentis, A. Aravantinos and more and a series of architectural competitions run by the State, a creative dialogue between architecture and society opens and a number of quality architecture public buildings are produced. During that time, city-planning designates the axis of Vasilissis Sofias Avenue, the connection of the centre of the city to the suburbs, to accumulate buildings that host cultural and research institutions (National Research Institution, 1961-63), museums (National Callery, 1964-76) as well as high-end hotel (HIlton, 1957), office and residential uses (Athens Tower 1968-71), while excluding commerce and entertainment. 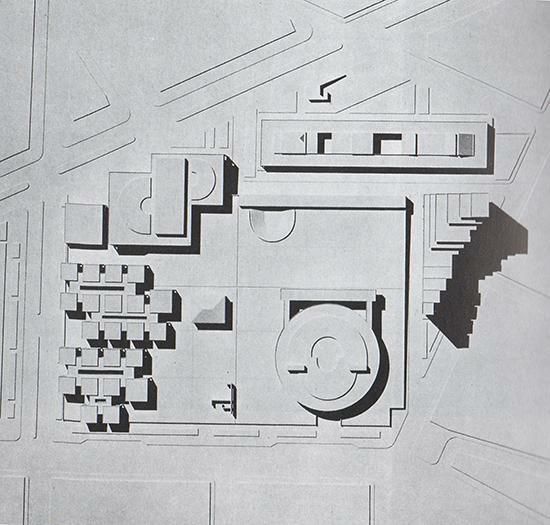 Ioannis Despotopolous: Music Academie, Athens, 1969-76. 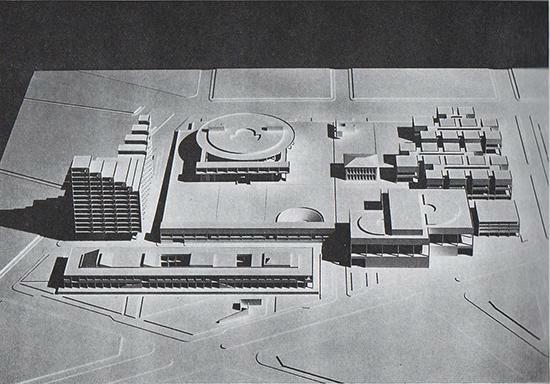 In 1961, State announces an urban planning competition for the development of a Cultural Centre for Athens situated between Vasilissis Sofias Avenue, Rizari Street, Vassileos Konstantinou Avenue and Rigillis Street. 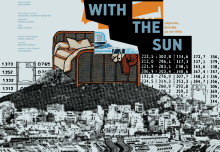 The winning proposal is submitted by Ioannis Despotopoulos, an architect of concrete intellectual background indebted to Bauhaus and a societal driven approach towards architecture and its relationship to urban planning. 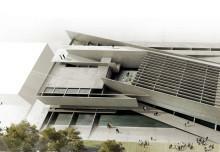 Ioannis Despotopoulos: Cultural Centre for Athens, Model. The design proposed an elevated rectangular plane framing a set of buildings that included a conference centre and concert hall, a theatre and opera, a library, galleries, exhibition spaces and a piazza. This strong geometric core that aspired to host the whole range of the city’s cultural conventions, also incorporated the adjacent Byzantine Museum the National Gallery, originally proposed to be situated at the junction of Vasilissis Sofias and Rizari street, as well as a proposal for a building to host the Music Academy. The radical modernism exemplified in this proposal was addressed with scepticism from the architectural community and intellectuals of the time. Raised concerns for the incorporpation of structures of that scale and form within the existing city fabric of Athens along with lack of proper funding, left this proposal unrealized except for the proposed design for the Music Academy. 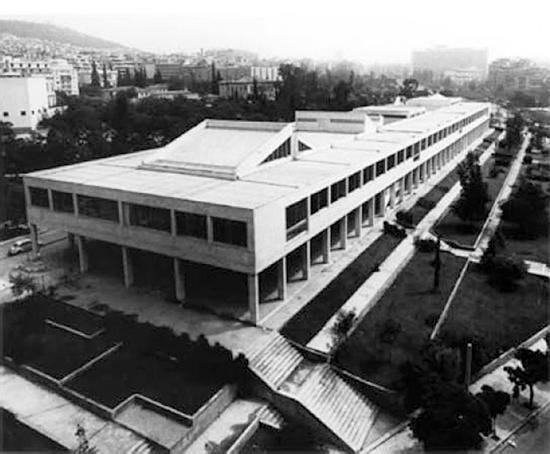 The building, situated on the junction of Vasileous Kostantinou Anenue and Rizari Street was constructed between 1969-1976 and hosts until today the Music Academy (Odeion Athinon) and temporarily the EMST (National Museum of Contemporary Art), to be accomodated in the former Fix building on Sigrou Avenue upon completion of refurbishment in 2013. Nikos Moutsopoulos, Pavlos Mylonas, Dimitris Fatouros: National Gallery, Perspective Drawing, 1957. Earlier in 1956-1957, runs the competition for the design of the National Gallery. The winning proposal belongs to architects Pavlos Mylonas, Nikos Moutsopoulos and Dimitris Fatouros who design a building that follows the spirit of Le Corbusier brutalist architecture. 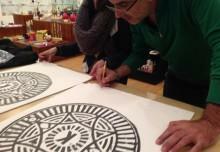 Τhe outcome of the competition raises a dialogue as expressed in local press (Zygos, 1957, no4, p66-71 – Zygos 1957, no6, p60-64), reflecting an engagement of the community to the efforts for establishing a metropolitan identity for Athens. 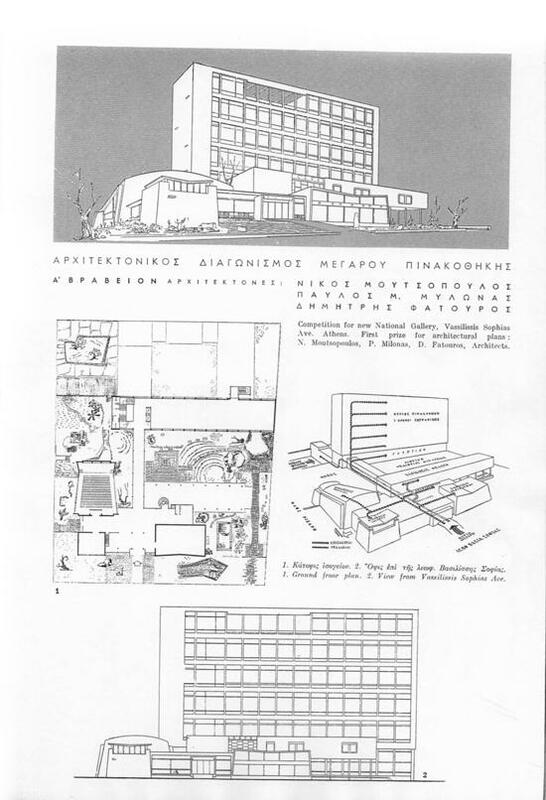 National Gallery competition publication in Zygos Magazine, 1957, no 22, p.66. 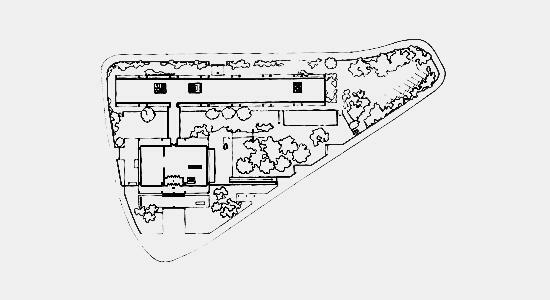 Following a change on location In 1970, the main idea of the initial design was retained, and adjusted to the shape of the new triangular-shaped lot. 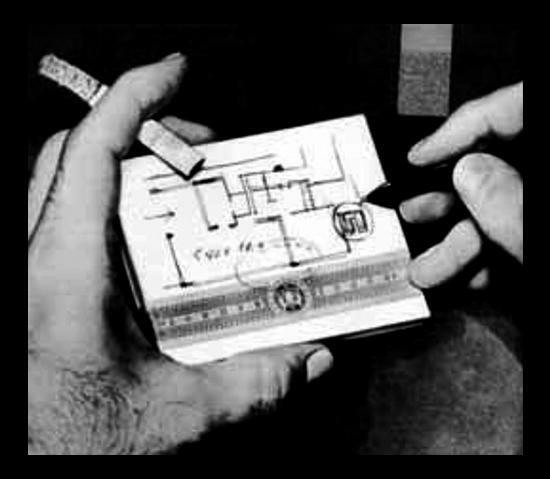 Pavlos Mylonas, Dimitris Fatouros, Dimitris Antonakakis (assistant architect): National Gallery, Top Floor Plan, 1970. 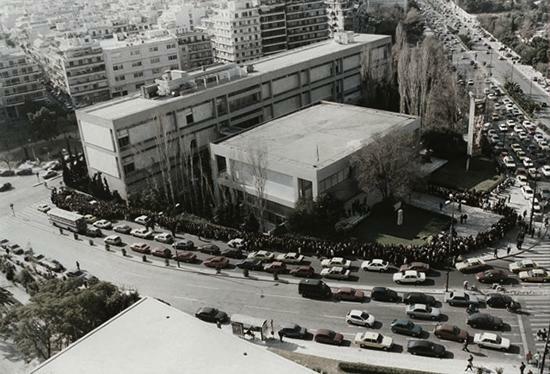 The building group consists of two main volumes, a long narrow multi-storeyed rectangular volume to house the main Gallery, the permanent exhibitions, the offices and storage areas, and the two-storey cube of the Alexandros Soutzos Museum, which includes the entrance and houses periodic exhibitions. The two volumes are connected by a narrow bridge forming an asymmetrical H.
Pavlos Mylonas, Dimitris Fatouros, Dimitris Antonakakis (assistant architect): National Gallery, 1969-1976. Architectural competitions can offer a framework of collaboration between the State, creators, stakeholders and the public, to effect change in the city in a dynamic manner. The 60’s offered such potential when there was a collective need to envision a new identity for Athens and from what it seems such need has emerged presently as well.